Welcome to the 17th edition of my BullCharts software Tip Sheets, focussing on tips and hints for BullCharts (the Australian charting software package). In this Tip Sheet below are snippets about the latest BullCharts version, and managing the colours that you can apply to watchlist items. Including how to change the default colours. Last Thursday night at the monthly ATAA meeting I delivered a 40-minute presentation "Technical Analysis - What is it really?". It was well received, with many guests in attendance having visited the ATAA stand at the Melbourne Trading and Investing Expo the weekend before. That 40-minute presentation is a cut down summary version of my 4-hour Technical Analysis Introduction seminar which I will be again running again in a few weeks time - Saturday 7 November at VSCH. More details are on my web site: www.robertbrain.com. To make a booking for this event please contact the Vermont South Community House (VSCH) directly (see details in column at right). Don't forget to visit my Share Market Toolbox web site - an arsenal of weapons to help you tackle the share market. I am always happy to receive feedback and suggestions for these Tip Sheets (and my Toolbox web site). Or if anything in a Tip Sheet is not clear, please feel free to contact me to ask about it (by email or phone). Or maybe I have made a mistake, which I will be pleased to correct in the next Tip Sheet along with an acknowledgement for whoever spots it first. Please feel free to send me feedback, or requests for additional topics for these Tip Sheets or the monthly eNewsletter articles. This TipSheet might look strange? The latest version of BullCharts is now 3.8.4. This is recommended for Windows Vista users, and for the Windows XP users who have a newer or faster PC. For less powerful and older PCs, the BullSystems staff recommend v3.4.1. See the notes on the BullCharts home page for details. This version has fixed some little glitches, including an improved Alerts feature (this was new in v3.8.0). Which version are you running? In BullCharts, click on the menu options: Help - About BullCharts. To get the upgraded version, see the BullCharts web site, or phone the BullSystems staff in the Sydney office to discuss. If you need some help to install a new version, Robert can be available (for a small fee). For a couple of BullCharts versions (since v3.6.4) we have been able to apply a colour to individual entries in watchlists (see accompanying figure). Secondly, once you do a scan, and you have a list of scan results, you can peruse a chart of each stock in the list and quickly mark the watchlist entry with a colour for a specific purpose. For example, your intended purposes might be: (a) Strong buy signal; (b) Possible buy signal; (c) Ignore. Note that you can't change the colour for an entry in the "Scan Results" list itself. But this list of stocks is automatically saved in a watchlist called "Last Scan Results", and you can change the colours in that watchlist. You can also change the NAME of this watchlist and move it into a watchlist FOLDER. To change the colour of a watchlist item, simply right-click on the entry and choose "Select colour" from the drop-down menu (sometimes you might need to wait 10 or 15 seconds for the drop-down menu to appear - just be patient). 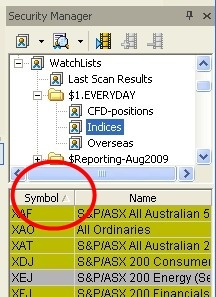 With any watchlist, you can sort the stocks in that list by Symbol, Name or Colour. Simply right-click on the watchlist (or on the "header" bar of the watchlist) and choose "Sort Order", and select the desired item to sort on. Don't forget, you also can reverse the sequence of the sort - in reverse Name sequence, or reverse Symbol sequence, etc. - simply left-click once on the "column header" in the watchlist. If you sort by Symbol or Name, then a small triangle will appear in the column header to indicate which column is the sort-column. And the triangle will point either up or down depending on the sort sequence. You can change the available colours for the watchlist entries. You can also change the default sort order for new watchlists. To do this you need to change the default values for the "Watchlist Folder Properties". 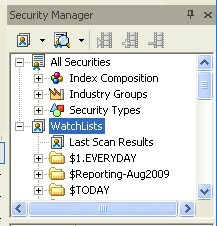 First, right-click on the "Watchlists" entry in the Watchlists (Security Manager) window (see accompanying figure) and select "Properties" from the drop-down list, and then the "Sort Order" tab. The "Watchlist Folder Properties" dialogue box will open (see below). 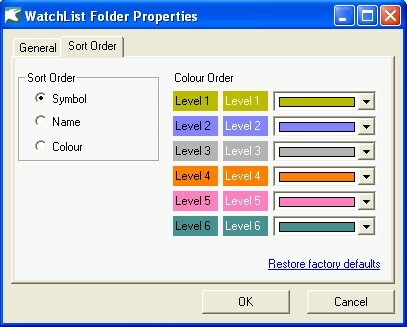 In this dialogue box you can change the default sort sequence for all watchlists, and you can change the colours that are to be applied. More details on some of the topics in these Weekly Tip Sheets are included in Brainy's Monthly eNewsletters that are now bundled into Brainy's Share Market Toolbox Membership privileges. Feel free to click on the relevant link at right to view samples and more details. These weekly Tip Sheets for BullCharts* users are intended to be short, quick grabs of information. They are not a replacement for the monthly detailed Brainy's eNewsletter articles, which cover these same topics but in much more detail. The eNewsletters articles also cover Technical Analysis and Share Trading topics. Also see the BullCharts on-line help (in BullCharts, hit the F1 key), and the relevant User Guide Chapter for more details (this is supplied with the software and copied to your hard drive as a PDF file). Note: Any screen shots shown in this newsletter are snapped from BullCharts version 3.8.2. FEEDBACK? - I am very keen to receive feedback about these weekly BullCharts Tipsheets. Please feel free to email me with comments, or suggestions. Contact details are included below. * - BullCharts is: "...an innovative charting and technical analysis system. It provides a feature rich and powerful set of tools with access to the latest strategies from local and overseas authors in analysing the dynamics of the stock market." This TipSheet has been composed in HTML and distributed using an online service, and is intended to be viewed in HTML (ie. web language) format. Some parts might look a little strange, especially if you are viewing a basically text-only version. I am working on a text-only version. We have also found that some web-mail clients (eg. Hotmail and Yahoo mail) can mess up some aspects. Please feel free to send me feedback if anything looks strange. Here's a quick quiz for you. Technical Analysis is a very broad subject. How much do you know about each of the following topics? A basic understanding? or a more detailed knowledge? At the 4-hour Technical Analysis Introduction seminar I am running on Saturday 7 November, I will give you a really good broad understanding of what Technical Analysis is all about. The above list is just a short version of the seminar topics that we cover. Complete with hand-out notes with all the detail. More information including details on how to register are on my web site here. The seminar venue on this occasion is Vermont South Community House. To enrol for any of these, you need to contact the VSCH directly by phone or email. If you have any questions about these, please feel free to email or phone me (or catchup at a BullCharts User Group meeting, or an ATAA meeting). This email was sent to brain@hotkey.net.au by robert@robertbrain.com.